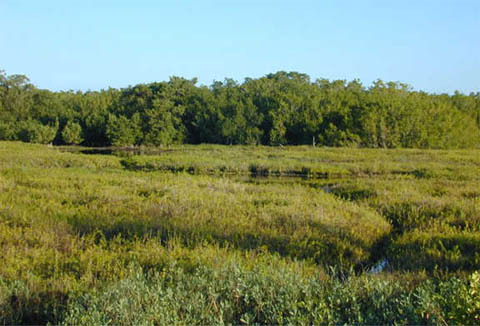 Coastal prairies are located inland from the mud flats of the Florida Bay. 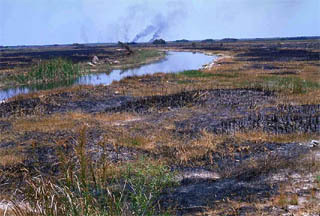 Coastal prairies occur along the western coast of the Everglades. Located between the dry land and tidal mud flats of the Florida Bay, coastal prairies are formed by the inland movement of mud during strong storms and hurricanes. These arid habitats often experience strong winds and may become flooded by storms and hurricanes. Lightning strikes are responsible for the majority of fires. 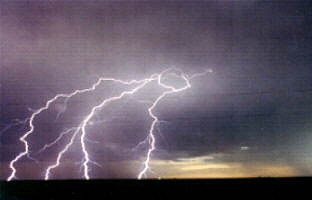 Fires are often started by lightning strikes, burning large areas of land. However, these fires rarely threaten human life or property and are often allowed to burn freely. Coastal prairie diversity is maintained by these periodic fires.